No matter your age, we all have dreams of experiencing some of the most awe-inspiring sights, found far and wide across the globe. But, deciding on which ones to include on a top list and how to rank them has been greatly debated. That being said, we decided on creating a diverse list of destinations we can’t seem to get out of our heads! From ancient wonders, to modern marvels, to natural phenoms and landmarks, there’s a little bit of something for everyone. 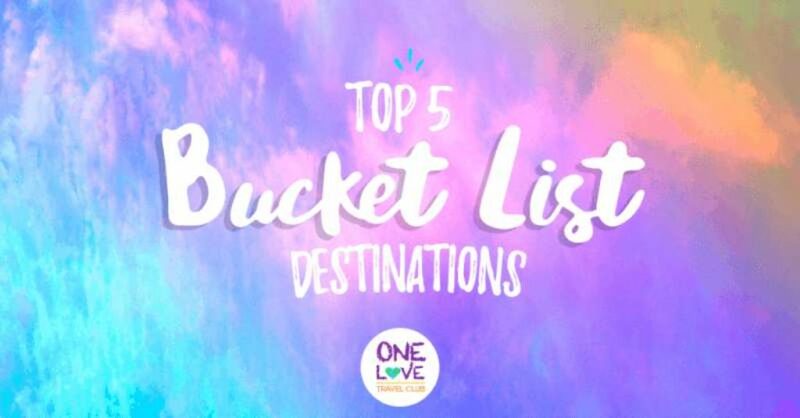 So, without further ado (and in no particular order), here is our top 5 list of places to cross off your bucket list in 2017/2018. Dramatic landscapes consisting of titanic glaciers, impressive waterfalls, lush green hills, and unique lava formations will have you convinced you’ve stepped inside your favorite childhood fairytale. But no fairytale is complete without elves and fairies. This belief is so embedded in Icelandic folklore that spotting tiny, wooden houses throughout the countryside can be an amusing pastime. If mythical creatures aren’t your thing, take advantage of prime whale-watching, or a crystal blue, natural spa like the famous Blue Lagoon, where you can relax amid snow-covered peaks and witness the spectacular light show that is the Northern Lights. There’s no doubt that the otherworldly, natural wonders of Iceland are magical and you’ll be enchanted upon visiting. Many of us are fascinated by getting ‘lost in translation’ when it comes to travel and there’s no better place to do this than Japan. From the natural beauty of the landscape to the most modern and imaginative architecture, Japan has so much to offer anyone regardless of what their interests might be. Marvel at the massive snow-capped Mount Fuji, walk the vast bamboo forests, and if you’re lucky enough, take stroll through down cherry blossom filled streets. But there’s more than nature to immerse yourself in. The zen gardens and Torii gates will instill a sense of serenity while the lively hustle and bustle of Tokyo and unique yet undeniably delicious street food will leave you in awe. They have seamlessly integrated the ways of the past with the ways of modern life. So you can expect your senses and imagination to be constantly challenged and delighted! At 227 miles long, 18 miles wide, and a mile deep, the Grand Canyon offers some of the most breathtaking views in the world. The Colorado River has been persistently carving its way in, around, and through for millions of years, leaving behind grandiose walls of striking mosaicked colors, particularly stunning during sunrise and sunset. Add to the mix hidden oases (Havasu Falls anyone? ), Native American ruins, and endless opportunities to get your adrenaline fix, you’re in for an adventure no postcard could ever capture! India is not so much a country you come to see, but a country you come to feel. Rich with diverse culture, landscape and spiritual traditions, it’s no wonder people come to “find themselves” here. Embrace your spirituality by practicing yoga, balancing your chakras, and getting in touch with your inner peace. Enjoy your first glance of the Taj Mahal at daybreak, haggle in the bustling street markets, fall in love with temple ruins and some of the world’s most majestic wildlife including elephants, tigers, rhinos, and leopards. India is a full assault on all your senses and a unique experience sure to change your life. If you love fun and adventure, Kenya is a melting pot filled with its wide array of possible activities. Offering some of the best and most accessible game viewing in the world, expect an appearance from the Big Five (elephant, rhino, buffalo, lion, leopard) that won’t disappoint, or witness one of nature’s greatest spectacles when 2 million wildebeest, zebra, and antelope run across the Serengeti during the Great Migration. Add in a trip to the coast to explore the coral reefs or just enjoy the turquoise water for the best of both worlds. Whether you want to observe wildlife with a premium view, interact with ancient cultures, or explore the African coast, Kenya is your dream destination. This world offers so many spectacular sights it’s nearly impossible to narrow them down to just 5! Did your top places make our list? Let us know what your list would be.